The section contains step-by-step information to help you use Novell® ZENworks® Application Virtualization to prepare the programs in Novell OpenOffice to run as virtual applications. Install ZENworks Application Virtualization onto a clean machine. You can prepare a clean machine by uninstalling Novell OpenOffice. However, we recommend that you start the process on a machine that has only the desired Windows OS, any applicable OS service packs, and ZENworks Application Virtualization installed. Starting with a machine that includes only these items helps to ensure that your virtual application does not contain settings that might cause conflicts. Click Start > All Programs > Novell ZENworks Application Virtualization 7.3 > Novell ZENworks Application Virtualization 7.3 to start the application. Click Capture Before in the Snapshot section of the Virtual Application ribbon. This process captures the first snapshot image. Snapshotting iterates through the file system and registry, and might take several minutes to complete. (Optional) Click the down-arrow on the bottom of the Capture Before button, then click Save Snapshot. Saving the first snapshot lets you skip this step when snapshotting subsequent applications from the same clean machine image. Install Novell OpenOffice.org on the clean machine. You can download Novell OpenOffice from the Novell Downloads page. Click Capture and Diff in the Snapshot section of the Virtual Application ribbon. Browse to and select the destination folder to store the snapshot, then click OK. This process captures the second snapshot, computes the delta between the two snapshots, and populates the virtual application with the delta entries. This process might take a few minutes. (Optional) Click the Filesystem button on the left side of the ZENworks Application Virtualization console to review the file system and registry entries. You can remove any files or settings that are not required for proper execution of your virtual application. Removing unused entries reduces virtual application size. However, accidental removal of a required resource might cause your virtual application to not function properly. (Conditional) If you use ZENworks Configuration Management in your environment and you want to control how virtual applications are used or to create and publish ZENworks bundles, click the ZENworks button on the left side of the ZENworks Application Virtualization console to display the ZENworks options. For more information, continue with the instructions in Section A.0, Using Virtual Applications with ZENworks Configuration Management. From the Startup File drop-down list, select the quickstart.exe file. Selecting the quickstart.exe file causes the resulting executable file to launch the OpenOffice Quickstarter. 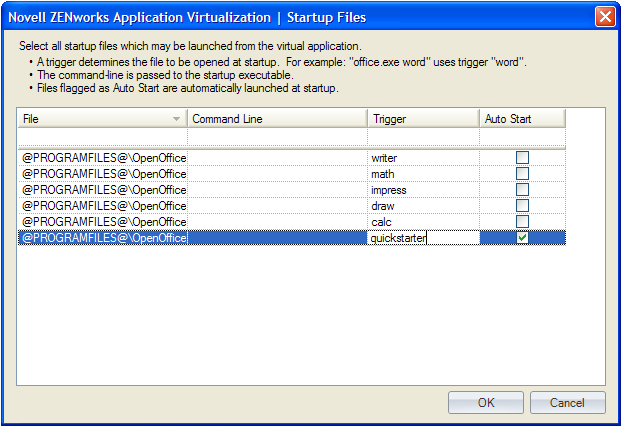 The OpenOffice Quickstarter, which displays in the notification area, lets users choose which OpenOffice application to launch (Writer, Calc, Draw, Impress, or Math). You can also create a single executable file to expose multiple executable startup files (Writer, Calc, Draw, Impress, or Math). ZENworks Application Virtualization allows multiple entry points into the virtual application to be triggered based on a command line argument to the virtual application executable. If you use Novell ZENworks or Novell ZENworks Configuration Management to distribute applications, command line arguments let you use the same application object for all OpenOffice.org programs. If you want to use the OpenOffice Quickstarter, skip to Step 12. If you want the virtual application executable file to expose multiple applications, continue with Step 11. (Optional) Click the Multiple button on the right side of the Startup File drop-down list to display the Startup Files dialog box. Click the File column on the first empty row in the startup file list, select scalc.exe, then press Enter. NOTE:If you cannot see the entire path to the scalc.exe file, expand the File column. To expose the drop-down arrow to select the executable file, click in the File field. Click the File column on the first empty row in the startup file list, select sdraw.exe, then press Enter. Click the File column on the first empty row in the startup file list, select simpress.exe, then press Enter. Click the File column on the first empty row in the startup file list, select smath.exe, then press Enter. Click the File column on the first empty row in the startup file list, select swriter.exe, then press Enter. Specify the desired command line trigger in the Trigger column for each row. If you create a trigger for each application in Novell OpenOffice, you can use the trigger as a command line option in ZENworks Desktop Management or ZENworks Configuration Management to launch the desired application from an application object. For example, if you specify writer for the trigger for OpenOffice Writer, you could use writer as the command line option to open Writer when the user opens the executable. 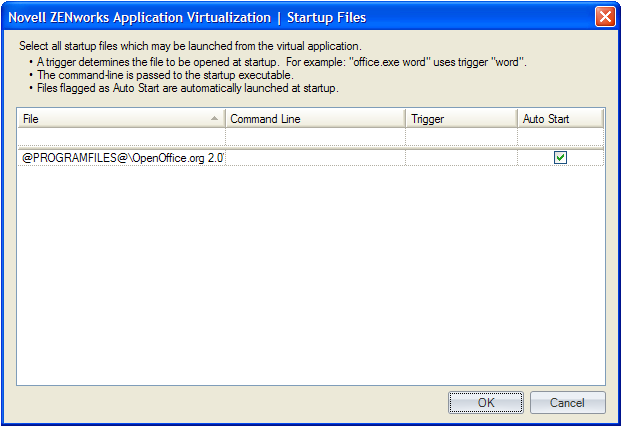 (Conditional) Click the Auto Start check box next to any startup files that you want to always automatically launch on virtual application startup. The Auto Start flag can be specified for multiple startup files to automatically launch multiple applications that are typically used together in a single session (also known as shotgunning). Click Build in the Build section of the Virtual Application ribbon to process the application. Specify the location and filename of the virtual application executable file. Test the virtual application executable file on another machine. The executable file is now ready to distribute to users. You can use any method you want to distribute the file, including USB thumb drives. You can also use Novell ZENworks or Novell ZENworks Configuration Management to distribute the file. For more information, see the ZENworks Documentation Web site.